The Charleston, Columbia, and Augusta tours got together for their annual Special Monday event at Orangeburg Country Club. The golf course was in spectacular shape and the greens were quick and true. In the Championship Flight, the lead changed hands back and forth between Charleston’s Chris Asbel and Charlotte’s Scott Tarcy and Jeff Jordan. Scott had posted a 75 and Chris and Jeff were tied with one hole to go. Chris made a 6-foot par save on the difficult 17th par three while Jeff Jordan’s par save slid by on the par three third hole to give the victory to Chris. In the A flight, Fred Dixon (Charleston) was rolling along on with a three shot lead heading into hole 18. It was a pulled tee shot that lead to a triple Bogie and a tie with Charlotte’s Mark Ballew who also fired a very nice round of 78. In the playoff the same tee shot that reared its head for Fred, showed up again and Mark was able to secure the victory with a par on the tenth hole. Mark Ducker from the Charleston tour rounded out the top three. In the C flight, Charleston’s David Carlson won his first tournament ever with a very nice round of 83 for a one-shot victory over Augusta’s Scott Wilson. Matthew Nemmes of Hilton Head, Matt Witt of Charleston and Augusta’s Robert McMillian all tied for third with rounds of 86. 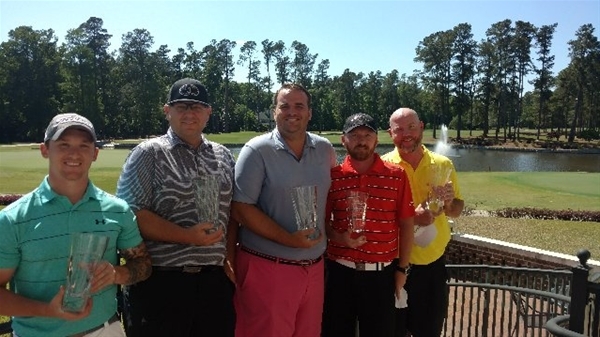 The D flight had Columbia’s Mike Bailey fire a 91 to post a two-shot victory over Charleston’s Chris Hill and Columbia’s Joseph Jones who both posted an 83 with Chris taking second place prize money on a scorecard playoff. Our next event is Sat May 19 at beautiful Seabrook Island as we tackle the Ocean Winds course.